Elder Siak Beow Teng was borned on the 10th of November 1916, the year of Fire Dragon in the People’s Republic of China. His family surname was Chen and his hometown was Hu Shi Town Yu Jin village in Pu Tian, in the province of Fu Jian. His family’s main source of income was from agriculture. His Master gave him the name “Beow Teng” which means "wonderful light" when he was ordained as a monk and his Dharma name is Tong Hui, which means "Understanding wisdom without obstacles". In 1923, when the young Beow Teng was seven, he started his basic education in a private school in the village. Barely two years later, Beow Teng’s mother, Madam Goh passed away unexpectedly. The young Beow Teng was deeply affected by the absence of his mother’s love and care. He never quite got over his mother’s death and often lamented that nothing is permanent in life. In 1925, at the tender age of nine, he had thoughts of entering monk hood but he decided to continue his studies in school. Not long after, young Beow Teng finally decided to enter the Xi Lai Temple in Pu Cheng as a novice monk and continued his basic education at the temple. In 1927, the Chinese Cultures Elementary class of Min Nan Buddhist College was relocated from Xia Men to Nan Shan Temple in Zhang Zhou. Soon after, a new Nan Shan Buddhist School was established where it admitted young children who wished to start their Dharma education that led to full ordination as monks. The school was also a place where they could learn basic skills such as ancient Chinese philosophy and calligraphy. The head of the school was the famous Min Nan Buddhist monk Venerable Zhuan Dao while Venerable Jue San was the school’s discipline master. 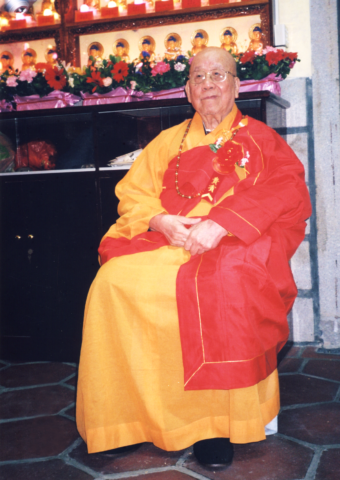 The school's Dharma Master was Venerable Da Ru. Not long after its relocation, the school changed its admission rules to accept lay girls and boys and became a full-day mainstream school. It was then the young Beow Teng started his third year of primary school education in this school. During these times, there was a revolutionary movement in China's education sector where socio-cultural activities such as drama, music, physical exercises and ball games were strongly encouraged. The school had also adopted bilingual education system where students got to learn English, Mathematics and Chinese languages, together with humanity subjects such as Geography and History. In 1930, Beow Teng completed his primary school education at the age of 15 and in the following year, he began his lower secondary school studies in a provincial school. Unfortunately Beow Teng fell ill soon after and he had to halt his studies abruptly to nurse his health. Four years later, in 1934, upon recovery he moved to another temple in Jin Ji Ting, Xia Men known as Pu Guang Temple where he learnt to chant sutras, and conduct Buddhist ceremonies rituals. At age 20, Beow Teng moved again and this time he arrived at a temple known as Cheng Tian Temple in Moon Terrace, Li Cheng, where he received the full precepts required of a Bhikkhu in a solemn tonsure ceremony. In this ceremony, there were at least 5 to 7 senior monks who were invited to be Beow Teng’s witnesses. Each monk has a significant role in ensuring that the ceremony was a successful event. The above-mentioned Venerables were well-known figures in the Chinese Mahayana Sangha community for their teachings and practices. 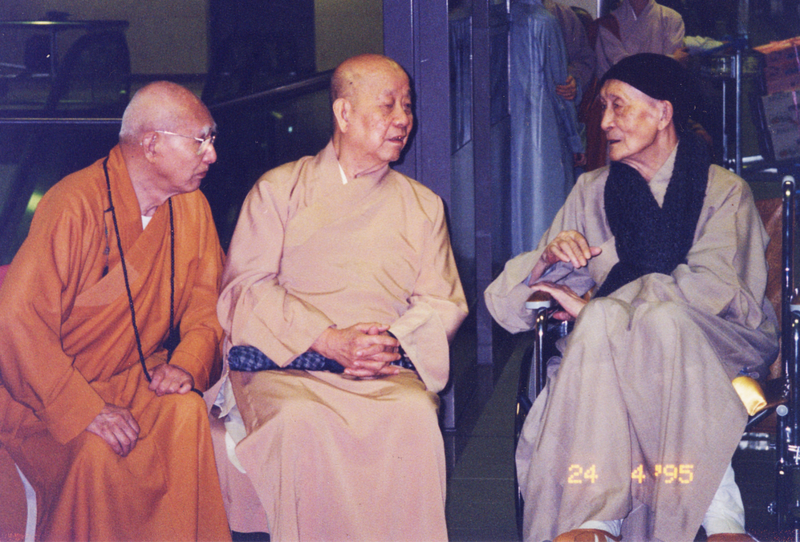 In the years soon to come, Beow Teng was very fortunate to receive teachings from many high monks such as Venerable Hong Yi and Venerable Hong Chuan who were legendary in their practice and understanding of Buddha Dharma and were very difficult to meet. The Sino-Japan war broke out in 1937 when the Japanese army invaded China. Beow Teng was then 22 years old. Since becoming a fully ordained monk at Cheng Tian Temple, Elder Beow Teng was given the position of Wei Nuo, responsible for leading the Sangha members in their morning and evening rituals, as well as their Seven-day meditation practices. At the same time, Elder Beow Teng had to ensure that the temple rules and precepts were strictly followed by every Sangha member. In addition to these duties, Elder Beow Teng had to attend to patrons as well as to receive visiting monks at the temple. His exemplary behaviour had earned him much respect from all resident and senior monks during his 8-year stay at the temple till 1942. Despite having to perform heavy official duties, Elder Beow Teng still found time to deepen his knowledge in the Buddha Dharma classics, which include The Hand Book of Surangama Sutra, The Original Explanation of Surangama Sutra, and The Discussion of Mahayana Sraddhotpada Sutra. His thoughts were deeply influenced by the direct teachings of the legendary Venerable Hong Yi such as The Practices and Vows of Samantabhadra Bodhisattva, and the Abhibavayatana Sutra or The Sutra of Eight Fields of Master. When the legendary Venerable Hong Yi was alive, he wrote a manual about the rites of conducting a tonsure ceremony. Elder Beow Teng conducted the first tonsure ceremony together with a group of senior sangha members, based on the instructions provided by this manual. Venerable Hong Yi was actually there to witness the inaugural ceremony himself. Life was very tough during the war, which lasted eight years. Food and monetary resources were severely lacking. As a result, monks at Cheng Tian Temple had to grow sweet potatoes and survive on them. Daily air raids in the area often forced them to rush towards the hills for their lives. 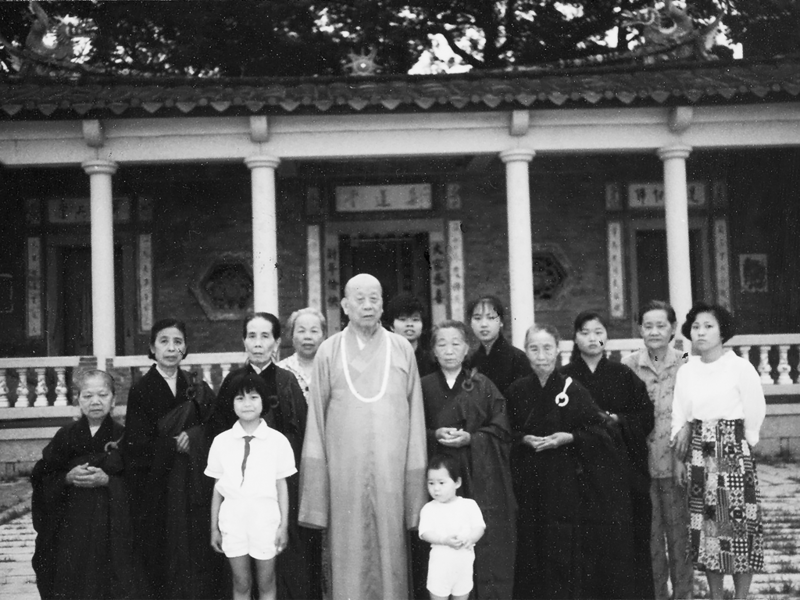 In 1942, Venerable Hong Yi passed away at Wen Ling Hospice. His last rites were performed at the Cheng Tian Temple where his body was cremated and his remains were placed in an urn. 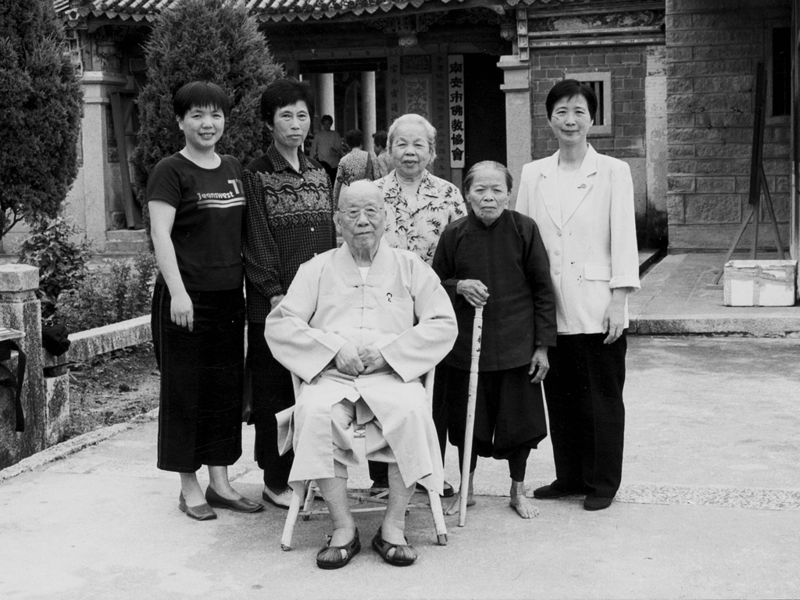 In 1943, Elder Beow Teng moved to Xue Feng Temple in Nan An. Venerable Rui Jing was the abbot while Venerable Guang Jing was in charge of day-to-day management of the temple. 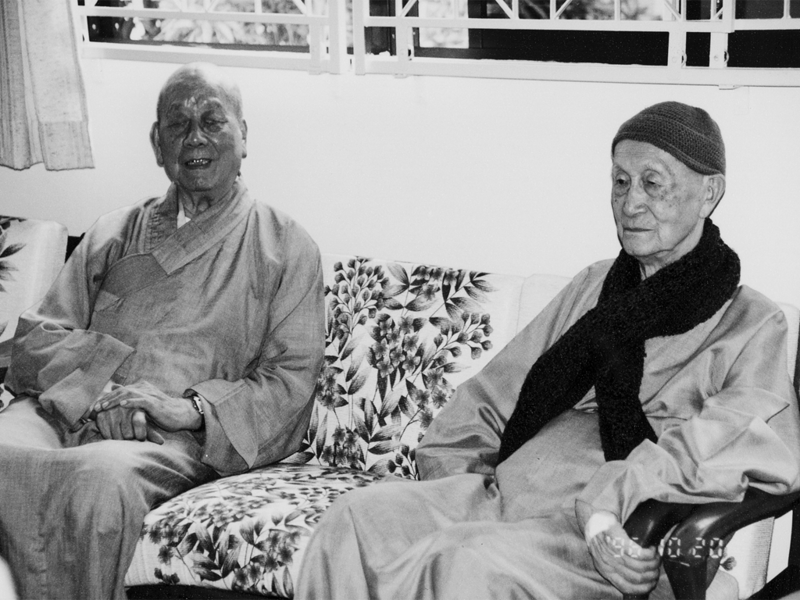 Years later, both Venerables left the temple to teach Buddha Dharma in the Philippines and Singapore. Elder Beow Teng was elected to take over Venerable Guang Jing’s duties as the Superintendent of the temple and stayed in the role for nine years, making his stay at the temple a total of 12 years. The revolutionary movement in China at that time gave rise to significant changes to the life of the monks. Instead of committing their time to practices and studying Buddha Dharma, they were forced to become farmers and survived on the food they grow. 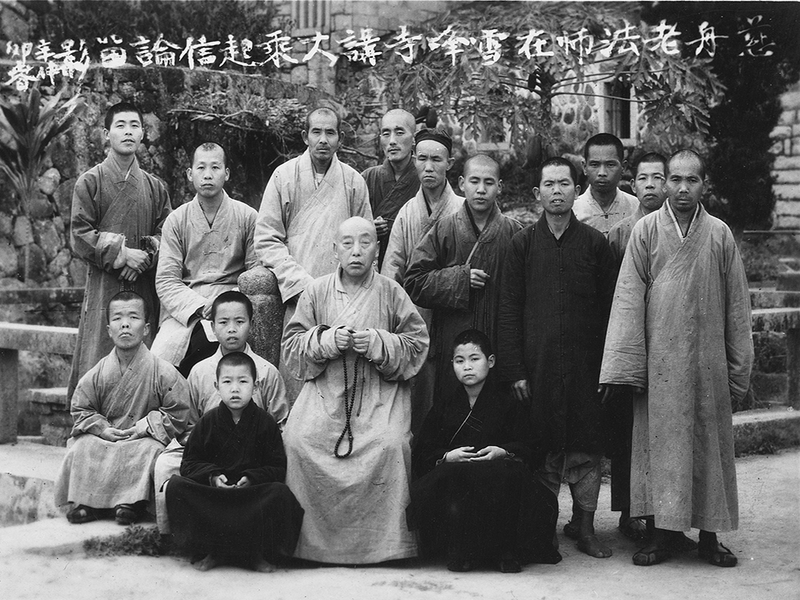 In the early 1950s, two high monks, Venerable Ci Zhou and his disciple, Venerable Miao Yin came to Xue Feng Temple upon Elder’s invitation to conduct Puja ceremonies and to expound Buddha Dharma classics such as The Discussion of Mahayana Sraddhotpada Sutra, which was later complied into a booklet known as the Explanation Notes of Mahayana Sraddhotpada Sutra. When the Elder had some spare time, he would study Elder Ou Yi’s works on the Essence of Mind / Consciousness and had gained much understanding from them. Elder Beow Teng had also started a building project that involved construction of the Merits Hall, the Dinning Hall and a Treasury building in 1952. With the support of the temple abbot, Venerable Zhuan Jie, Elder Beow Teng was able to restore the Main Prayer Hall, giving the temple a facelift that was quite unprecedented at that time. When Elder Beow Teng turned 40 in 1955, he moved to another temple in Li Cheng, known as Da Kai Yuan where he became its Superintendent. It was here in this temple Elder Beow Teng became interested in Chinese Medicine and spent many nights studying the science of Acupuncture and the various acumen points in the human body. During this period, the region surrounding the temple was hit by several natural disasters such as droughts and floods. The compassionate Elder Beow Teng had organized all kinds of social activities to help the victims to get over these difficult times. 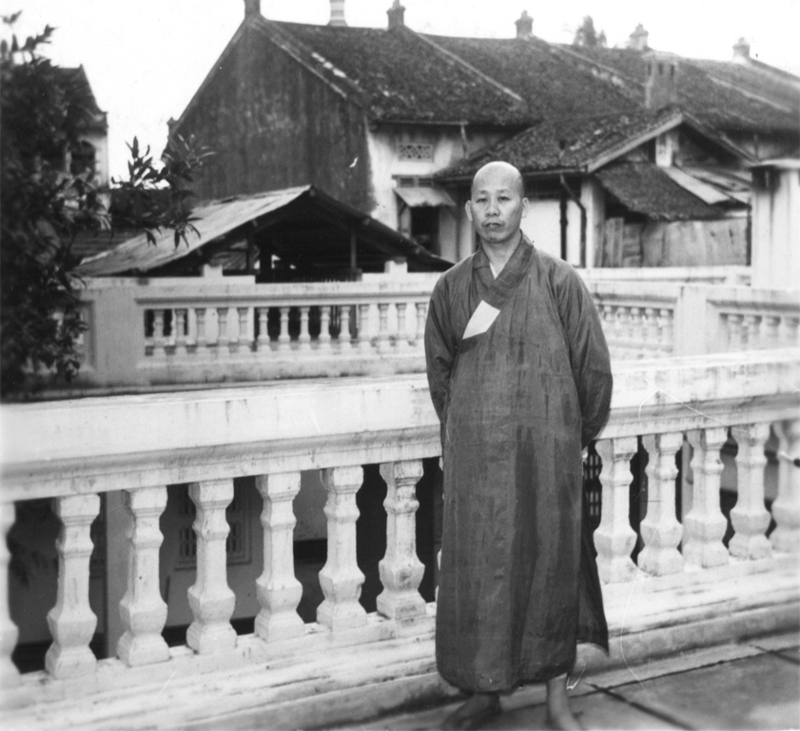 In 1957, at the year of 42, Elder was requested by Venerable Guang Yu, Penang, Malaysia, to teach in his temple, Miao Xiang Lin. Once the relevant authorities approved Elder Beow Teng’s travel papers, he began his journey to South East Asia to teach Buddha Dharma in the early autumn that year. From Shan Tou, in the province of Guang Dong, the Elder embarked the journey to Malaysia via a boat to Penang where he stayed briefly. Six months later, in the mid summer of 1958, Elder Beow Teng agreed to move to Singapore, at the invitation of Venerable Guang Qia, to accept the role of Superintendent at the Long Shan Temple. The then abbot of Poh Jay Temple, Venerable Zhuan Jie, in 1960, tasked Venerable Qing Kai to invite Elder Beow Teng to accept the roles of abbot, trustee and Superintendent at his temple when he retired. However, the Elder had only agreed to accept the role of Superintendent. Venerable Zhuan Jie passed away in autumn in the same year. Elder Beow Teng then took over the duties for the role of abbot. In 1984, the Port of Singapore Authority acquired the land where Poh Jay Temple was situated and requested for the temple to be relocated. After much deliberate efforts, Elder Beow Teng found a new address for his temple. It was the former Women Buddhist College for Buddhist Studies. Before this college was established, it was a Dharma centre known as the MahaBodhi Vihara, where the famous Buddhist educator Venerable Ci Hang had taught many Buddhist disciples and propagated Buddha Dharma. The Women Buddhist College for Buddhist Studies had to stop operations due to lack of students. Upon completion of its relocation, Poh Jay Temple was renamed Poh Jay Si Buddhist Association. Elder Beow Teng left China since 1957 and he had dedicated 38 years of his life living and teaching in South East Asia. During the years he spent in Singapore, Elder Beow Teng had made tremendous contributions to the Buddhist community and the society of Singapore. In 1966, Kong Meng San Phor Kark See Monastery held major Buddhist events such as the first Dharma Precepts Society and the Universal Liberation of Beings Chanting Service, also known as Shui Lu Da Fa Hui. The Elder was appointed as the Superintendent and the Guest Relations Officer for these events. He was also the Deputy Dharma Master for the Inner Grand Prayer Hall and led the Sangha on the study of rules and ceremonies at the temple. Having to have studied Chinese Medicine, he was invited by Venerable Chang Kai and Venerable Hong Chuan to assist in the setting up of a Buddhist Free Clinics. Elder Beow Teng was strongly recommended by the Board of Directors to continue his work in Buddhist Free Clinics as its Treasurer and Chairman. In the 1990s, Elder Beow Teng was later promoted to the position of Secretary-General in the management committee that oversees the planning and development of these clinics. In those years, the free clinic service was extended to constituencies such as Ang Mo Kio and Jurong. A rehabilitation centre was also established at Bukit Merah. Elder Beow Teng was an active member of the local Buddhist community. He used to conduct monthly Dharma Talks at Poh Jay Temple. Known for his Buddha Dharma lectures, Elder Beow Teng was once appointed as one of the senior teaching monks at the Singapore Buddhist Lodge, Ci En Lin, Kong Meng San Phor Kark See Monastery and the Singapore Buddhist Youth Mission. He was even invited to talk about Buddhism at the radio station! It did not take long for Elder Beow Teng to start education projects that involved building a Secondary School and the reconstruction of Maha Bodhi Primary School for the Buddhist community. The secondary school is known as Manjusri Secondary School, which is the only Buddhist-based, government-aided secondary school today. In 1984, with the kind invitation from Da Cheng Xin Yuan Temple, in the Philippines, Elder was appointed as the third Mentoring Master for the Dharma Precepts Puja event and left Singapore to participate in this event. The chance to return to his home country, the People’s Republic of China, came in 1988, when Elder Beow Teng was invited to witness the consecration ceremony of the restored Xue Feng Temple. 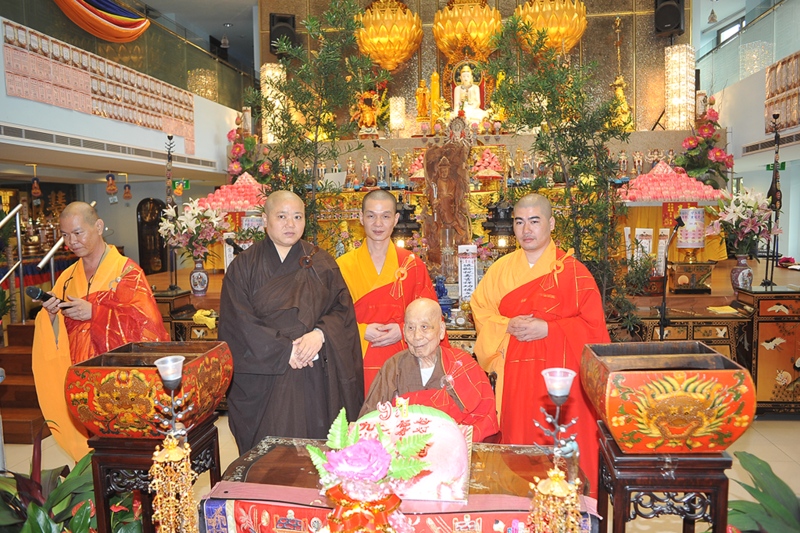 In the same year, the Singapore Buddhist Federation organized a puja event where the Elder was the appointed Assistant Speaker of Buddhist Rites Ceremony. 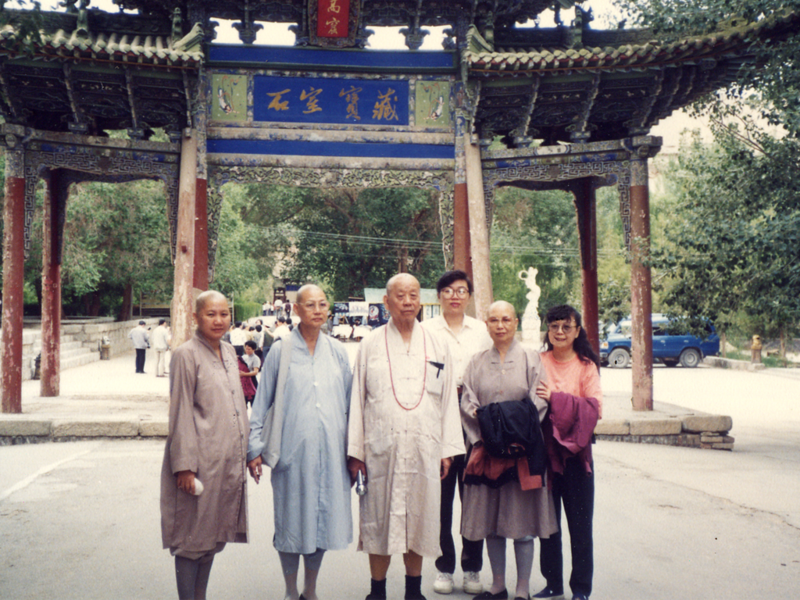 In 1990, Elder has been invited to attend Hong Shan Temple and the Tiger River Cave Temple to conduct their consecration ceremonies in Xia Men, China. Since leaving China for South East Asia, during the period between 1974 and 1986, Elder Beow Teng has been to countries such as Japan, Taiwan, South Korea, the Philippines and India to give lectures on Buddha’s teachings and participated in pilgrimages to learn about other Buddhist cultures in the regions. Elder was elected as the Chairman of the Singapore Buddhist Federation in 1992; Chairman of Redevelopment Building Committee of the Maha Bodhi Primary School Redevelopment Project and was also appointed as the Chairman of Maha Bodhi School Management Committee by the Ministry of Education. 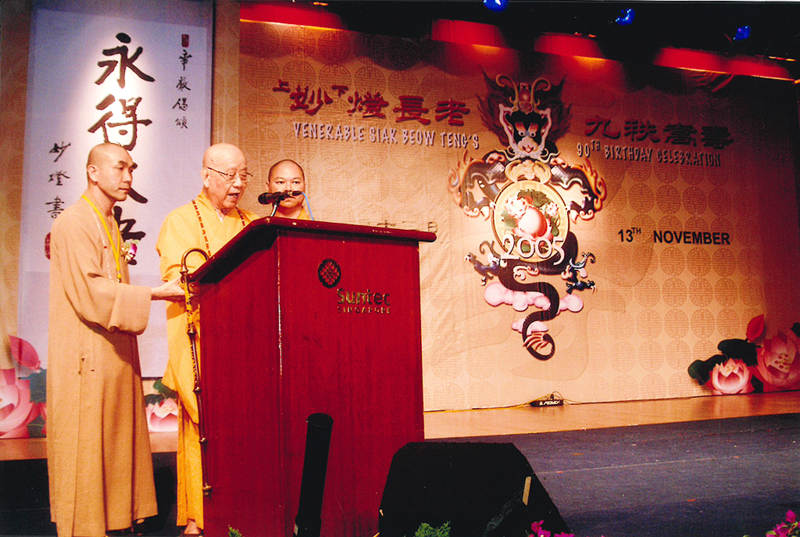 Since being elected as the Chairman of the Singapore Buddhist Federation, Elder had made revolutionary changes to the Supervisory Committee which is an independent body established to ensure that all management committees such as the Maha Bodhi School Management Committee, under its jurisdiction are managed and compliant to the guidelines set. The compassionate Elder had and worked ceaselessly to steer the Buddhist Community in the right direction. He did not retire till 1994 at the ripe old age of 80. Elder has been a role model for many who worked and studied with him. Despite being busy with the mundane duties of managing people and resources, Elder always found time to study and research on Buddha Dharma classics. His favourites have been The Books of Master Tai Xu and more recently, literary works from Venerable Yin Shun, The Note Book of Master Yin Shun. A typical day in Elder Beow Teng's life today will involve chanting of sutra from 2.00pm to 6.00pm, to dedicate the merits to all sentient beings. In recent years, Elder has spent most of his time and effort in studying, in particular, the five sutras of Pure Land Buddhism. The Pure Land Practice involves seeking rebirth in the Land of Amitabha Buddha through recitation of his sacred name: “Amitahba”, with sincere faith and vows, leading to one-pointedness of mind or samadhi. During his 19 years’ stay in Singapore, Elder Beow Teng was an active member of the local Buddhist community. Known for his in-depth understanding of Lord Buddha’s teachings, Elder Beow Teng was invited as one of the key Dharma Masters at many well-known temples such as me Singapore Buddhist Lodge, Ci En Lin, Kong Meng San Phor Kark See Monastery and the Singapore Buddhist Youth Mission He was even invited to talk about Buddhism at the radio station! Elder was indeed much sought afier by many people who wished to understand the wonderful teachings of Lord Buddha and be liberated from sufferings. In 1992, other than holding the positions of Abbot, Spiritual and Dharma Advisor of Pu Ji Si Buddhist Research Centre, Elder was also the Deputy Chairman of Buddhist Free Clinics. Concurrently, he is also the appointed Spiritual Advisor for various Buddhist associations such as the Singapore Buddhist Lodge, Singapore Buddhist Youth Mission, Buddha of Medicine Welfare Society and Cheng Beng Buddhist Association. He was also appointed Trustee of Long Shan See Temple, Pu Tuo Temple and Fa Hua Temple. Elder Beow Teng is known in the Chinese Mahayana Buddhist community as a conscientious practitioner who is also compassionate and sincere in his dealings with people. Elder never fails to deliver what he has promised and he is certainly an excellent role model for serious practitioners in the Sangha and Buddhist communities in Singapore. Elder Beow Teng is a highly respected, senior Mahayana Buddhism monk in the Buddhist Community of Singapore. He has extensive knowledge and understanding of the Mahayana Tipitaka, which he almost spent his entire life studying and researching. As a serious practitioner, he had kept strict observance of the precepts that he took since the day he was ordained in 1935. Elder has been a great Buddha Dharma Master for both Sangha members and lay Buddhists. His contributions to the propagation of Buddhism in Singapore have been extremely influential and far-reaching.